During the early 1970s movies featuring Asian martial arts became very popular in the US. Comics soon followed. 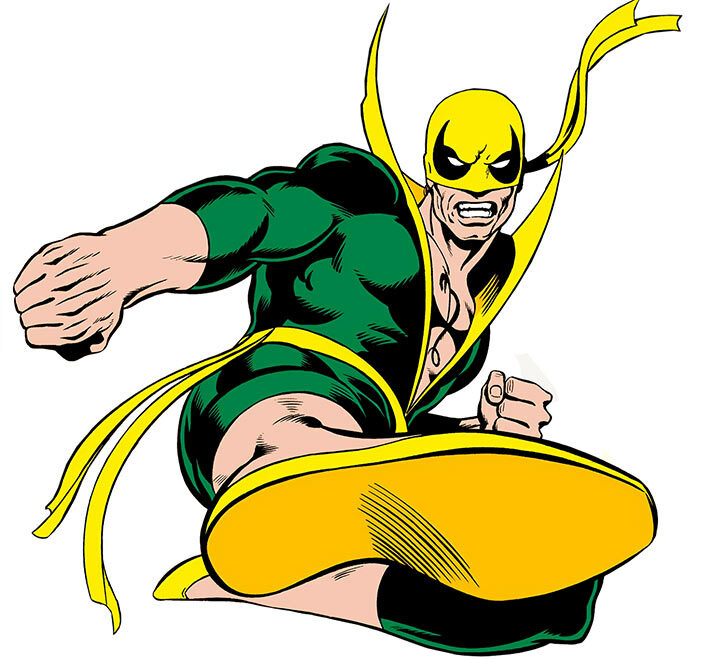 Released in 1974, Iron Fist was one of Marvel Comics’ main “kung-fu” characters, along with Shang-Chi. 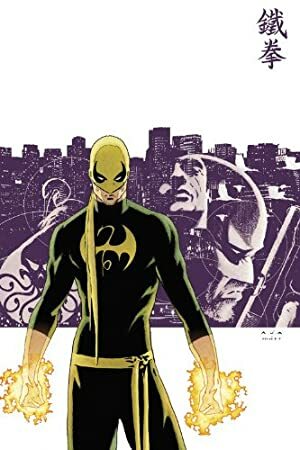 Whereas Shang-Chi was relatively grounded, Iron Fist was a more fantastic character with superhuman powers and close ties to a magic city from another dimension holding many secrets. When the martial arts fad receded, it was counter-intuitively decided to pair him up with another character facing cancellation – Luke Cage. It worked surprisingly well. This entry is a gisted profile – a sort of starter writeup to benchmark game stats and provide an overview of the character. Most of it was done during the early 2000s, well before the Immortal Iron Fist revelations. We plan to produce chronological Iron Fist profiles, but there’s only so much time available. Real Name: Daniel Thomas Rand-K’ai. Other Aliases: Daniel Thomas Rand (legal name in the US), the Young Dragon, the Living Weapon. Occupation: Adventurer. Former businessman, bodyguard, private investigator, research assistant and warrior. Known Relatives: Wendell Rand-K’ai (father, deceased), Heather Duncan Rand (aka the Silver Dragon, mother, deceased), Yu-Ti (aka the August Personage in Jade, adopted uncle), Miranda Rand-K’ai (aka Death Sting, half-sister), Lord Tuan (adopted paternal grandfather, deceased), Lady Ming (adopted paternal grandmother, deceased), Thomas Duncan (maternal grandfather). Group Affiliation: Former partner of Luke Cage aka Power Man II, former member of the Heroes for Hire, former Defender. Height: 5’11” Weight: 175 lbs. K’un-Lun is a stronghold of a colony of human-like aliens, whose spaceship crash-landed upon a small, extra-dimensional world a million years ago. For most of this period, the warp drives of the ships somehow created an oscillating gateway between the pocket dimension and Earth, revolving K’un-Lun into a remote corner of the Himalayas (presumably in the Kunlun mountain range ) once per decade. The involuntary colonists settled a built a city around their crashed spaceship. The cannibalized it to help build the town in a style imitating the interior of the ship. With the passing of millennia, none remembered their true origins, and that the Hall of the Ancestors was once a spacefaring vessel. Their noble, traditionalist civilization of excellence and respect continued to develop, though. K’un-Lun is traditionally co-ruled by the aliens’ human-like descendants and by powerful beings called the Dragon kings. These are themselves the subjects of the godlike sorcerer Master Khan. The mystical energies in K’un-Lun are so strong that their land of the dead, Feng-Tu, has physical existence in their pocket dimensions. The K’un-Lun dead have thus been known to interact with the living. Traditionally, the land of the dead is ruled by the ruler of K’un-Lun, the August Personage in Jade, after he dies. 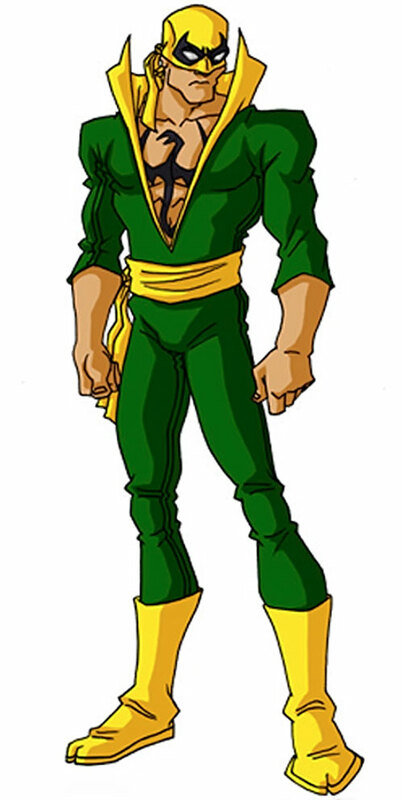 The mystical emerald crystal that regulated the interdimensional interface, making them a regular cycle, was broken years ago by K’-Lun adopted champion Iron Fist. This made the appearances of the city erratic and unpredictable. Later, Iron Fist made the interface even more rare by binding it to his own heartbeat, making it impossible for K’un-Lun to appear in a place where he wasn’t. K’un-Lun undoubtedly gave rise to numerous Chinese legends about the mountain range being the home of the Taoist immortals, since there are obvious similarities between K’un-Lunians and such immortals. Years ago, American businessman Wendell Rand discovered K’un-Lun and entered the city. During his stay, he saved the life of K’un-Lun ruler Lord Tuan, who adopted him as his heir – to the resentment of Tuan’s actual son, Yu-Ti. Rand also married a woman named Shakari, and fathered a daughter, Miranda Rand-K’ai. At some point, Rand Sr. also won ritual combat against Davos, son of K’un-Lun’s greatest warrior, Lei Kung the Thunderer. Being the victor earned him the right to claim the power of Shou-Lao the Undying, a man transformed into a mystic serpent over a thousand years ago by a Dragon king named Chiantang. 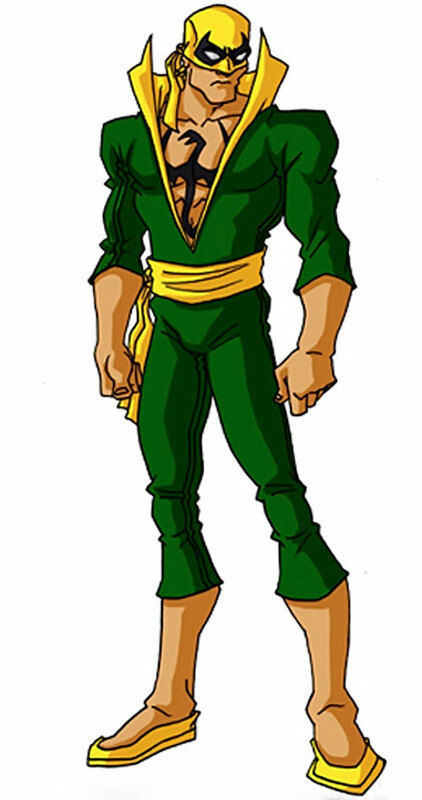 Wendell Rand declined the opportunity, though, and thus didn’t join the long line of K’un-Lun’s best warriors who had wielded the power of the iron fist. Meanwhile, Lei Kung, banished his son to Earth in shame. 10 years after entering K’un-Lun, Rand was showing Shakari the dimensional interface when Yu-Ti’s men attacked them. Shakari was slain, and the grief-stricken Rand seized the opportunity to return to Earth. 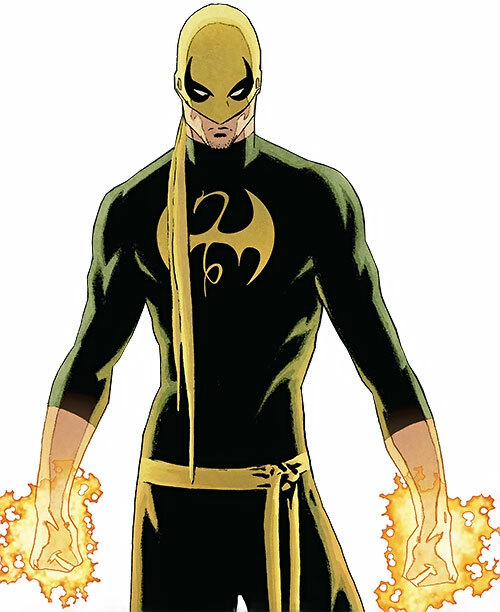 Iron Fist is capable of summoning his chi (sum total of his body’s natural energy) to reinforce his natural abilities. He is capable of focusing that energy into his hand and draw upon the super-human energy derived from the mystic serpent Shou-Lao and make his fist inhumanly powerful and resistant to injury. Early in his career Danny could only use his “iron fist” a limited amount of times because of the drain on his system, but has since shown that he can use it much more frequently. He can routinely channel his chi to ignore cold or enter a deep meditative state (in DC Heroes terms, Suspension). 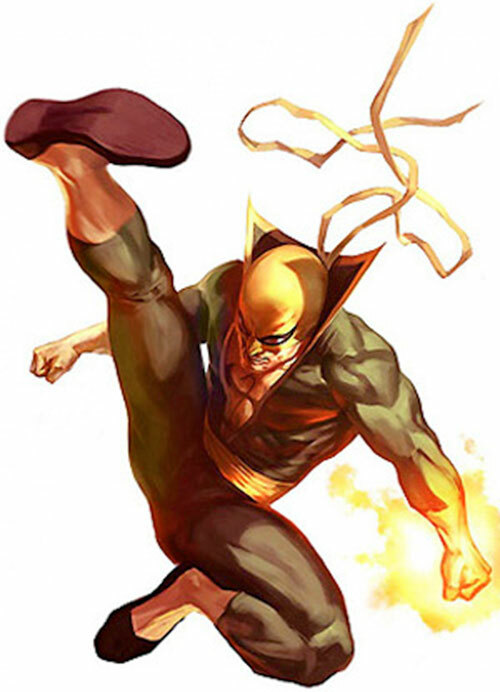 Iron Fist is a master of martial arts of K’un-Lun. These seems to include every Asian martial art ever devised, including many lost ones. He is generally considered to be one of the greatest martial artists alive, although not on the level of Shang-Chi or Captain America. He is also extremely adept at gymnastics and acrobatics, and is an experienced detective. His sight is remarkably acute. Daniel Rand-K’ai the son of businessman Wendell Rand, who had once lived in the fabled city of K’un-Lun. It exists in an otherdimensional realm and materialized in the Himalaya once a decade. Wendell Rand-K’ai, as he was know there, was the eldest son and heir of Lord Tuan. Tuan ruled K’un-Lun, in the guise of the August Personage in Jade. However, Wendell was driven from K’un-Lun by his brother. This man not only wanted to rule K’un-Lun himself, but who was Wendell’s rival for the love of a woman named Shakari. Wendell found refuge on Earth and became a successful businessman in the United States. In his absence, Tuan died and Wendell’s brother succeeded him as the August Personage in Jade. Within a year of coming back to Earth Wendell married a woman named Heather, who bore him a son, Daniel. When Daniel was 9, his family and his father’s business partner, Harold Meachum, went on a mountaineering expedition. Their goal was K’un-Lun, which was scheduled to interface with the Earthly plane soon. When a storm arose and Daniel and Heather fell of a cliff, Wendell was dragged along. While Heather and Daniel landed safely on a ledge, Wendell dangled above the chasm. Meachum, hoping to gain control of the business, and harboring a secret love for Heather, refused to assist Wendell. He instead crushed his hands so that Wendell fell to his death. Meachum offered to help mother and son but both refused him and forced him away. Heather led her young son in search for a way home. However, she was lost in the storm until she found a suspension bridge. A pack of hungry wolves were stalking the 2 ; sensing their prey would escape attacked. Heather urged her son on while she sacrificed her life to save him. Her heroic death in close proximity to K’un-Lun, however, meant her spirit ascended to K’un-Lun’s lands of the dead : Feng-Tu. Meachum also survived, through crippled by severe frostbite. Having learned of Daniel’s survival, he spent the next decade heavily fortifying his home, waiting for the inevitable attempt at vengeance. 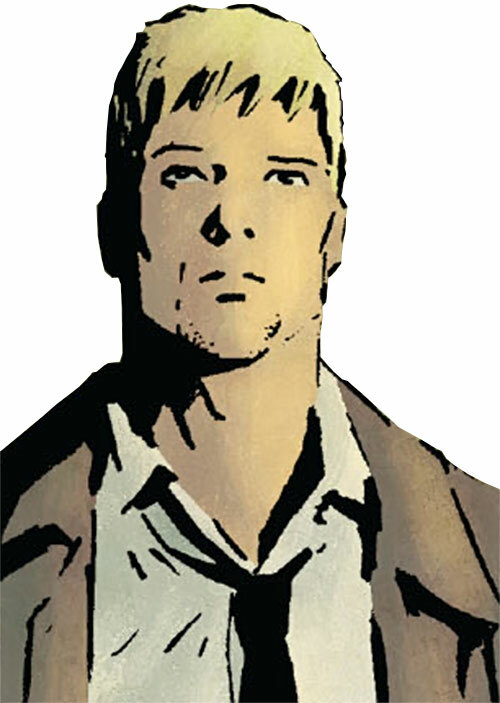 Daniel was found by the citizens of K’un-Lun and trained in their martial arts by Lei Kung, the Thunderer. Daniel was naturally adept at the martial arts and by age 16 had progressed through many advanced levels. He toughened his hand by thrusting them into dust, then sand, then gravel and finally, rock. His closest friends where Miranda, whom he didn’t know was his half-sister, and a lad named Conal D’hu-Tsien. Rand secretly taught martial arts to Miranda, in defiance of K’un-Lun sexist laws. 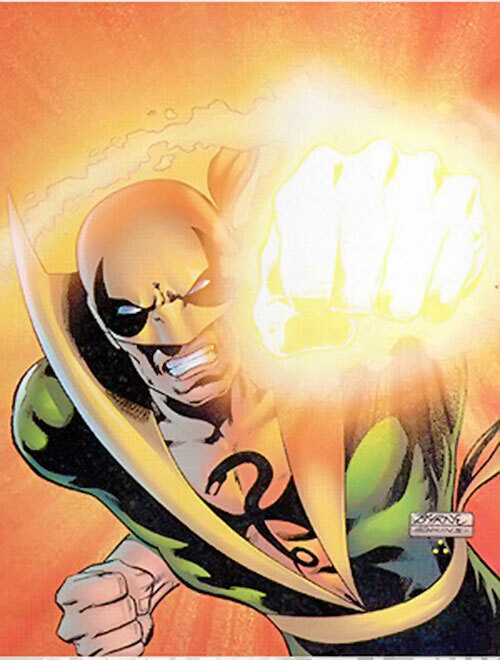 When Rand turned 19, he was given the opportunity to claim the mantle of “Iron Fist”. This could be accomplished by battling the serpent, Shou-Lao the Undying. During the battle, Daniel grabbed on the serpent and was permanently scarred by its chest marking, so that he now has a flying dragon tattooed on his chest. Rand not only defeated the creature, but actually slew it – an unprecedented feat. He plunged his hand into its molten heart and gained superhuman powers to reinforce his blows. His exploit has consequences. The death of Shou-Lao angered the Dragon King Chiantang, his creator. He attempted to destroy K’un-Lun in retaliation. While his enormous power would have made that quite possible, he was banished by Master Khan before he could do so. Also, some of the warriors of K’un-Lun grew jealous of the incredibly talented foreigner, which triggered a brawl against Daniel, Miranda and Conal. After the fray, Conal and Miranda had to flee but were captured by the enemies of K’un-Lun, the plant-like beings called the H’lythri, living in the alien dimension outside of the city. Rand opted to return to the America rather than stay in K’un-Lun for another 10 years. There, he confronted Meachum, only to discover that he was now an invalid from frostbite. Rand took pity on him, but Meachum was later assassinated by the ghostly Ninja. Rand had to clear his name for this murder. He associated with a pair of private detectives he had befriended. These were the samurai-trained Colleen Wing and the cyborg ex-cop Misty Knight. While adjusting to America, he also started adventuring as iron Fist, fighting such menaces as a cult of Kâli or Warhawk. Rand’s relationship with Meachum’s brother, Ward, and daughter, Joy, was not the best. Nevertheless, they reached an agreement in which Rand he became a full partner in Rand-Meachum (and thus a rich man) while Joy actually ran the company. This allowed Rand to concentrate on his good deeds as Iron Fist, and on his relationship with Misty Knight. 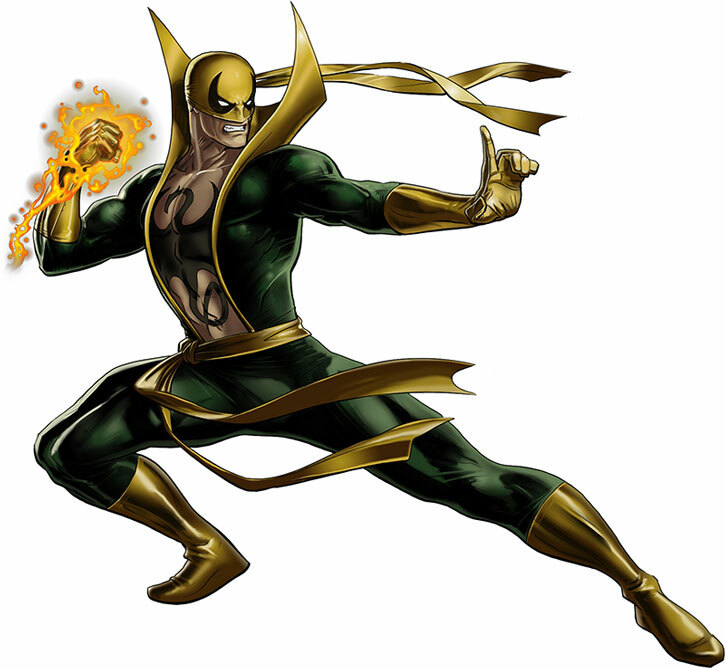 Iron Fist fought such foes as the Steel Serpent (a martial artist specialized in dim-mak who had tried several times to conquer K’un-Lun) or Dhasha Khan, a sorcerer-warrior who had conquered Feng-Tu. During that adventure, Iron Fist met Jade. As the receptacle of the cosmic Firebird, she was embodiment of all that was good with humanity. Although he loved her and wished for her to remain human, Rand accepted to let her become the Firebird more fully as humanity needed her in that role. Iron Fist was also defeated by a warrior from Feng-Tu serving Dhasha Khan, named the Silver Dragon. After he defeated him in a rematch, Iron Fist discovered that his foe was actually the spirit of Heather Rand. Vanquishing Dhasha Khan, Mr. Rand returned his mother to her quiet afterlife. After some more adventures (involving Master Khan, Scimitar, the Wrecking Crew, Sabertooth or Davos, now also calling himself the Steel Serpent) Rand eventually became acquainted with Luke Cage and the two soon became partners in Heroes For Hire Inc. It was not his first partnership, as Iron fist had often worked along with other martial artists such as Shang-Chi, the Sons of the Tiger or the White Tiger, but it was to be his most lasting. At one point, Fist and Cage went back to K’un-Lun, only to discover the H’lythri had struck and decimated the eternal city. The heroes led the remnants of the K’un-Lun warriors against their foes. However, Iron Fist had been changed by his time on Earth and was now disillusioned with the regimented culture of his hometown. Yu-Ti betrayed him in an attempt to appease Master Khan, but even Khan feared the iron fist and the heroes walked way free. 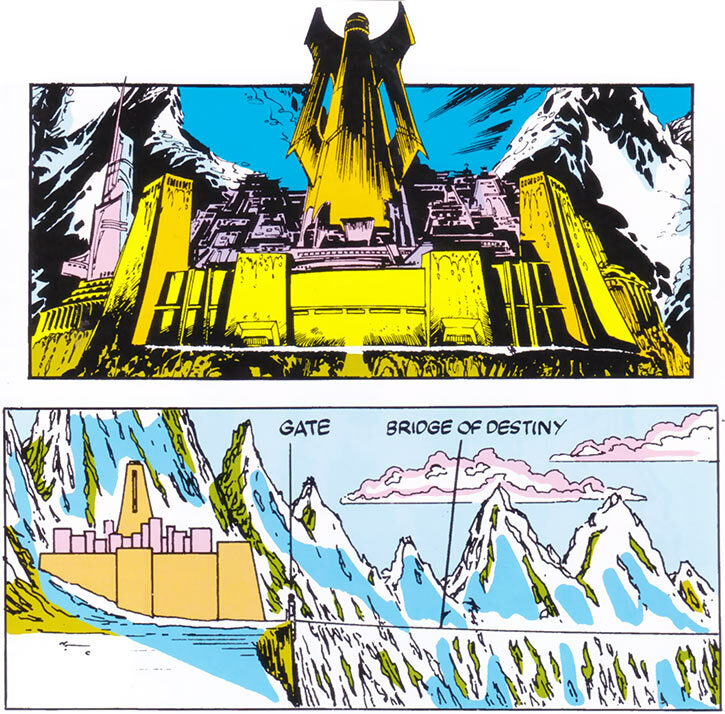 Iron Fist then damaged the crystal controlling the interface cycle between K’un-Lun and Earth. This made it erratic. Khan himself was trapped on Earth, allowing Chiantang to escape and nearly destroy K’un-Lun. Khan enlisted villains to strike back against Cage and Fist, stealing the iron fist power and nearly killing him. However Iron Fist managed to strike back, recover his power and banish Khan. Later on, the young Captain Hero (Bobby Wright) lashed out at Iron Fist, who was trying to heal him, and seemingly killed Rand. However, nothing was as it seemed. ”Wright” was actually the shape-changing Super-Skrull, mesmerized and used as a pawn by Master Khan. As to “Rand”, he was the H’lythri duplicate. The real Iron Fist had been secretly captured by the H’lythri and replaced by an impostor. Khan, in his apparent triumph, seduced Misty Knight in his guise as NYPD policeman Tyrone King, the one-man SWAT team. He then killed Chiantang (who had made it to Earth after a recent banishment from Iron Fist) and framed Cage for the murder of “Iron Fist”. 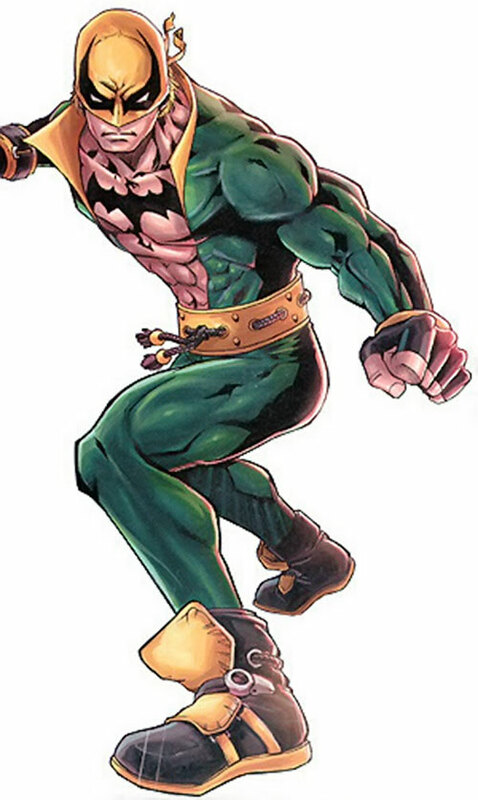 Months later, the Super-Skrull, no longer the pawn of Khan, used his power to imitate Iron Fist as a ploy against Namor. Colleen Wing and Misty Knight, now doubting the death of Iron Fist, exhumed his remains to reveal the plant-like tissues of the duplicate. Namor and the 2 women soon freed Rand from the clutches of the H’lythri. Khan turned Namor into am amnesiac as a revenge. However Rand, Knight and Wing the Submariner, who apparently slew Master Khan. Cage’s named was cleared, although by that point he wasn’t interested in actively reforming his adventuring duo with Rand. Iron Fist also discovered that while he was gone Oracle Inc., Namor’s company, had bought Rand-Meachum. Allying himself with Namor, Rand took a position at Oracle. 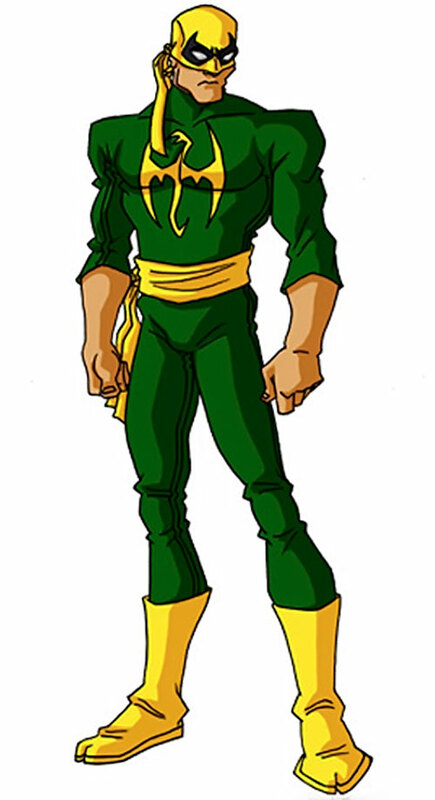 Iron Fist continued his career as a relatively minor hero.&emsp,He eventually started losing his faith in himself, which due to his link with Shou-Lao threatened to have mystical consequences. The alien Contemplator gave him new purpose. During that quest the Steel Serpent was resurrected and tried yet again to conquer K’un-Lun. The 2 men fought and Iron Fist recovered his power, even renewing his relationship with Misty Knight. Thus, when most prominent heroes disappeared after the Onslaught crisis, Iron Fist was willing to carry on their heritage. Using Oracle money, he launched a new, bigger version of the Heroes for Hire (with the brief help of Cage). He also attempted a scheme to merge K’un-Lun and Earth together and bring about a new golden age. Meanwhile, Namor sold Oracle to Stark-Fujikawa. The new owners of the Heroes for Hire fired Cage and Ant-Man due to their criminal records ; the rest left in disgust. The heroes lost in the Onslaught crisis then came back, meaning that the expanded Heroes For Hire were no longer a necessity. Rand alos ended up fighting Conal and Miranda, the latter now known as Death Sting. His childhood friends weren’t dead, but were now H’lythri agents. 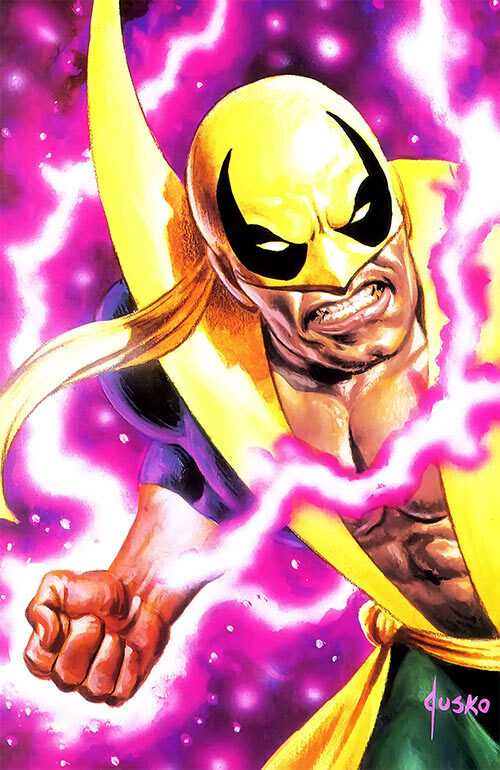 Iron Fist also came to the conclusion that a merger of Earth and K’un-Lun would never work. He started working on stopping what he had put into motion. But his efforts had already been hijacked by the Hand, led in this endeavour by teenage assassin Junzo Muto. Muto stole the iron fist power, then kidnapped Misty to lay an ambush for Rand in Tōkyō. Junzo Muto wanted to merge K’un-Lun with Tōkyō – but he needed Daniel Rand to be present since the magic city’s Earth manifestations were now bound to him. The ghost of Iron Fist’s mother told Danny he just had to wait it out. Without him, K’un-Lun would bounce off Tōkyō and into a random dimension. However, this might devastate K’un-Lun, and Muto would torture Knight to force Rand to show up. Iron Fist came to Japan ; K’un-Lun started to merge with Tōkyō with catastrophic results. Iron Fist teamed up with Wolverine, Yu-Ti, Cage and others (including Sunfire, Captain America, Iron Man and Psylocke) to defeat the Hand and stop the merger. The heroes beat back Muto, the ninja horde and the hypnotized dragons of K’un-Lun. However, the merger seemed to be permanent until Yu-Ti, reasoning it couldn’t exist without Iron Fist, fatally stabbed Rand from behind. K’un-Lun mostly recessed from Earth. Some elements were left behind, such as a few dragons. Iron Fist was resurrected on the spot by the spirits of Feng-Tu, led by his mother. He stayed for a while, helping the Japanese deal with the left-overs from K’un-Lun and helping the dragons adapt to their new home. Nightshade, and old Heroes for Hire enemy, then resurrected Chiantang. She wanted to use him as an unstoppable weapon against the Black Panther (T’Challa). She blackmailed the dragon via a genetic bomb introduced in his DNA. However Chiantang spun an elaborate web of deception, disguising himself as the demon Mephisto then switching bodies with Ross Everett, the US liaison of the Black Panther. Chiantang also magically returned the iron fist power to Iron Fist. He then unbalanced Rand’s chi and hypnotized him to serve as his weapon against the Black Panther. During the fight, Iron Fist inflicted enough damage to the Panther to result in a brain aneurysm, which soon would have dire repercussions. However, with T’Challa’s help, Danny recovered his free will. Chiantang then manifested in his full dragon form in New York City. He was repulsed by Black Panther, Iron Fist, a powerful Wakandan military task force and nearby US armed forces. The fight eventually drifted to Wakanda, where Chiantang was defeated. During an altercation with armed thugs, Iron Fist dodged a bullet. It flew on to kill a young mother at a nearby window, leaving an orphaned baby. This terrible event and a recent break-up with Misty Knight led Rand to retire. He moved to a remote estate in Colorado. However, he was tracked down by Mary Blue Cloud, a teenage American Indian with precognitive powers. Mary had foreseen the return of the exiled K’un-Lun wizard Chi. The sorcerer would attempt to use Rand’s link with K’un-Lun to return there and have his revenge. Meanwhile Chi’s shadow-thieves agents started killing hundreds to power their master. A reluctant Iron Fist eventually defeated Chi in K’un-Lun with Mary’s help, and returned back to the path of the hero. As of this writing, Iron Fist tends to be drawn manga-style. This gives him a youthful air. He wears his hair somewhat short, in an anime hero cut. 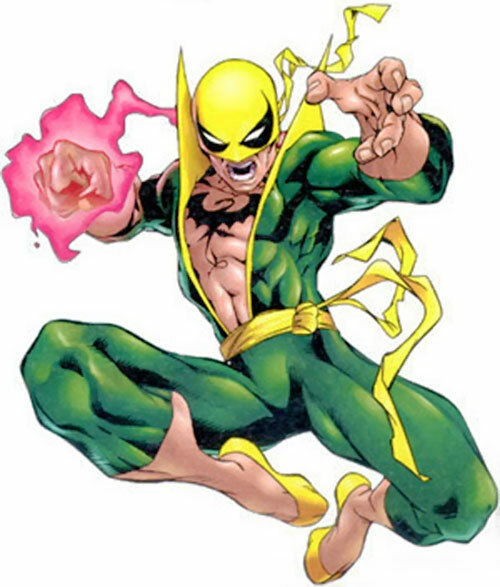 Early in his career, Iron Fist was unfamiliar with the normal world, and obsessed with avenging his parents. This very intense, very focused worldview collapsed when he couldn’t take Meachum’s life, leaving him hollowed out. Due to this life-consuming buildup and anti-climax, Danny remains somewhat aimless despite his incredible training and mental and spiritual integrity. He tends to doubt his abilities, his actions and his role as a hero because he wasn’t born to be one. e keeps being dragged into being Iron Fist as a textbook Responsibility for Power motivation. He is overtly analytical and quite skeptical about what he does. If an innocent is killed due to what he perceives to be his own fault (and he will easily decide things are his own fault), he may retired until fate drags him yet again into the life of a fighter. However, despite those doubts, Danny seldom descends into self-pitying and whining. He lacks a clear path, but this is more of a philosophical dilemma than angst. His questions are closer to “am I doing the bright thing ?”, “should I be wearing a costume and fighting ?” or “does the violence in my life means that my friends will inevitably get hurt ?”. When he’s not pondering his role, his goals are pretty simple – a good life, which means he’s after money and is generally nice so he can enjoy positive situations. He’s generally an amiable, likeable, open-minded guy. He’s usually social and jovial. He’s no comedian and isn’t as funny as he thinks he is, but he’s obviously laid-back and tries to avoid violence. 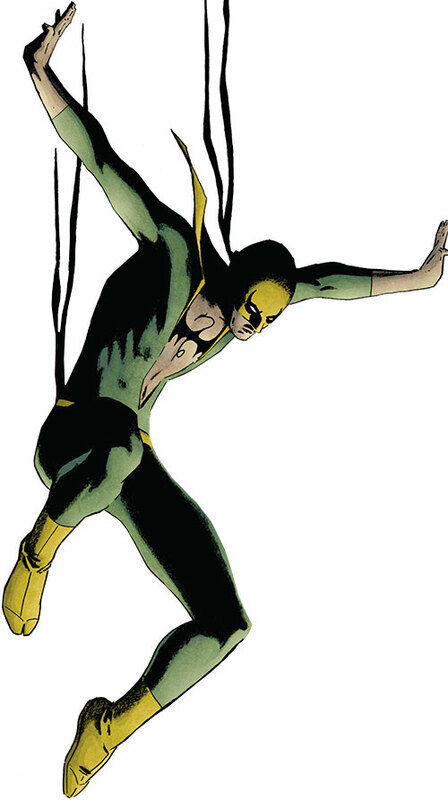 Iron Fist alternates between group work (where he will soon feel he relies too much on others, and that it dulls him) and solo work (where he will soon feel he could achieve more as part of a dedicated force for good). He finds his best equilibrium as part of a duo – and is of course at his best operating along with Luke Cage. The friendship between Cage and Danny is rock-solid despite their vast differences. They both know the other is truly a good man, dedicated to justice and having overcome formidable obstacles to become what he is. Part of Iron Fist’s doubts and feelings of inadequacy come from his K’un-Lun upbringing. He’s supposed to be the champion of an otherdimensional, mystical civilization that is a million years old. K’un-Lun has vast, formidable traditions and a very rigid sense of honour and duty that is nigh-unbearable for a normal human being. Danny view this fantastic legacy as an incredible, shining Camelot. He considers that his K’un-Lun heritage and culture have much to bring to humanity. However, being a one-man agent of cultural change toward something incomprehensible to most of his contemporaries is likewise too big, and doomed to doubt and failure. Thus, while Danny may seems to some like an hesitant, superficial slacker, he’s actually strong. Living his life without being crushed by who he is and where he comes from, and even remain a nice and amiable person, is remarkable. 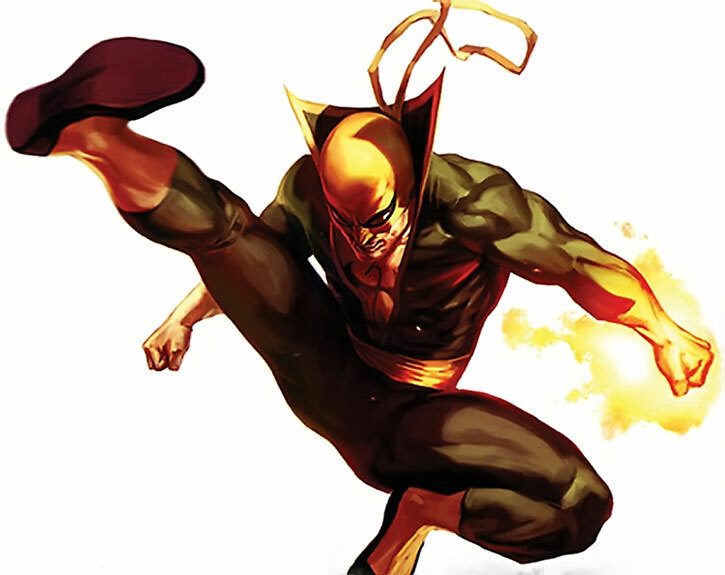 Iron Fist has been around for years and his on friendly terms with a large number of heroes – such as Spider-Man, Wolverine, the X-Men, the Black Panther, Namor, etc. He seldom calls on their help, but he will easily work with them during chance encounters. Obvious parallels exist in DC during the high flying Kung Fu action days of the 70s. Iron Fist would have met Richard Dragon, Ben Turner, and Lady Shiva (collectively known as the Kung Fu Fighters). Story arcs involving the League of Assassins also come to mind. In fact, Fist could conceivably *replace* Richard Dragon, as the two can be amalgamated without too many problems. His friendship with Cage would of course be replaced with his friendship with Turner, and there are definitely similarities between K’un-Lun and Nanda Parbat. 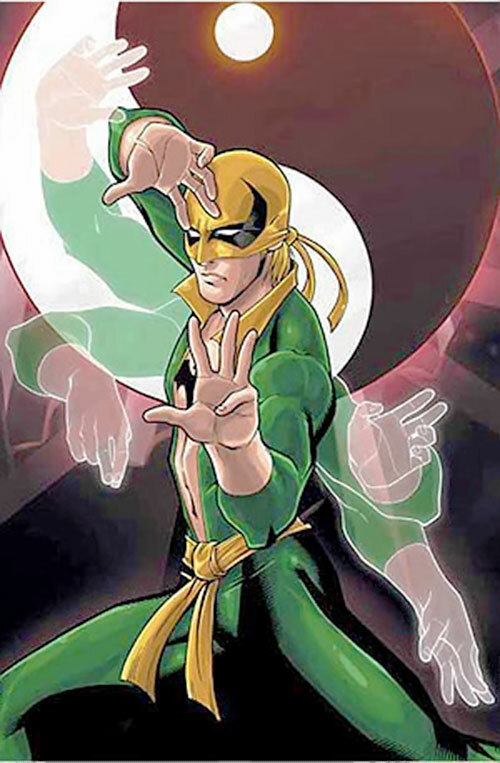 Iron Fist’s Expertise (K’un-Lun) can be employed to boost his Detect when it comes to sensing mystical energies from K’un-Lun. Mind Probe is Seriously Marginal, has No Range and is Symmetrical (both subjects gain RAPs of knowledge, deeply intimate in nature, about each other) (total -5). Detect has a R#09 that is tested *before* usage. Medicine (medical treatment, surgery) is Seriously Marginal (and Iron Fist often Pushes on top of that). Medicine (medical treatment, surgery) can be used without any equipment (not even a sterile environment) through the application of chi. Expertise (Asian cultures, martial arts lore, K’un-Lun), Iron Nerves, Lightning reflexes, Language (Kunlunese, Japanese, several Chineses), Schticks (Iron Fist, Master of Chi, Pain Tolerance (Medium), Signature Subplot (Adrift in aimlessness, over-thinking things and self-doubt)). Luke Cage (High), Misty Knight (Low), Colleen Wing (Low), Shang-Chi (Low), Sons of the Tiger (Low), Matt Murdock/Daredevil (Low), NYPD (mostly through Detective Scarfe, Low), Namor (Low). Voluntary Exile (from K’un Lun), Unluck, Public identity, Attack Vulnerability (making him doubt his role as Iron Fist, -1CS OV/RV). Iron Fist has very Hero Points -intensive capabilities, and needs a constant flow of Hero Points to function currently. Thus, his performance is a tad erratic. Sometimes he’s nearly the greatest hand-to-hand fighter in the Marvel Universe, sometimes he’s a aimless, whining space cadet and a third-stringer. Another aspect of this is that Iron Fist will launch himself into half-baked Subplots because he needs HPs (especially his Signature Subplot, which he launches over and over again), and/or take the decisions not to spend more than 10-15 HPs during some adventures so as to build up a war chest. These appearances are the ones where he looks the most ineffective. …like unto a thing of iron ! The Iron Fist Schtick allows a character to augment through HPs his EV by the APs of his Martial Artist score, rather than his STR. It also allows to use the full Martial Artist APs as EV substitution, rather than a limited version thereof, and does not necessarily makes such an attack Killing Combat. Thus, by going all-out and spending 10 HPs, he can strike with an EV of 10+10=20. This makes Iron Fist’s fist(s) glow with a coruscating aura of a warm colour, but he can make his fists glow without spending any HPs, through simple concentration. Said EV is generic EV – some people have house rules for defenses against Martial Arts-boosted EV. If this is your case, the blows from the iron fist are not covered by this rule. This EV has occasionally be used to crush something held in Fist’s hand instead of punching. Also, as a misc. bonus, the RV of the Fist’s hand and wrist during the Phase he uses the iron fist is equal to the EV he employs – as his fist becomes… like unto a thing of iron ! Note that this ability can be mystically manipulated – Danny has often been deprived of it, or had it stolen by another. For such purposes as Draining, Neutralizing, Duplicating, etc. this Schtick is treated like Mental Blast (ML, No Range): 10. The minimum number of RAPs the Action Check for the Pushing attempt can score is 1, even if it completely misses the mark. The “Push fee” is diminished from 3 HPs per AP down to 2 HPs per AP. Burnout only occurs on a failed roll of 7 or less. With the GM’s permission, this Schtick allows the Character to use his Martial Artist Skill for Power Tricks having to do with paranormal energies — this explains a lot of the weird, one-shot chi stuff Danny has done. Energy Blast has No Range, No AV (use Martial Artist or DEX) and is Gradually Fatiguing (vs. Spirit due to Mystic Link). Expertise (Asian cultures, martial arts lore, K’un-Lun), Lightning reflexes, Language (Kunlunese, Japanese, several Chinese), Schticks (Master of Chi, Pain Tolerance (Medium)). Luke Cage (High), Daughters of the Dragon (High), Shang-Chi (Low), Sons of the Tiger (Low), NYPD (mostly through Detective Scarfe, Low). Voluntary Exile (from K’un Lun), Unluck, Attack Vulnerability (making him doubt his role as Iron Fist, -1CS OV/RV), SIA toward the Self-Doubt Subplot. This limitation represents a power that taxes the character the more he uses it. The character must make an Action Check using half (rounded up) the APs actually used (which may be less than maximum) as the AV/EV. The OV of the check is equal to half the APs of the power (regardless of how many APs were used), while the RV is either the Character’s Body, Mind, Spirit, depending on whether the Power is Physical, Mental, or Mystical, respectively. Hero Points may be spent to increase the OV/RV of this check. Each Phase the Character uses the power within a 15 AP time period (every day) the above procedure must be repeated adding one AP to the AV/EV of the check past the first, up until a maximum AV/EV equal to the amount of APs being used of the Power. Senses 1(K’un-Lun Mystical Energies Awareness), Check Required 5 (Expertise: Martial Arts). Enhanced Skill (Perception 2), Limited (visual). Protection 2 and Enhanced Fortitude, both Limited 3 (cold). Iron Fist — Strength-based Damage 5. Healing 14, Check Required 1 (Expertise: Martial Arts), Tiring. Mind Reading 8, Close, Side Effect (subject receives the same result against him, always occurs), Tiring. Close Attack 6, Defensive Roll 3, Evasion, Extraordinary Effort, Improved Initiative, Improved Disarm, Improved Grab, Improved Hold, Improved Trip, Instant Up, Languages 4 (Kunlunese, Japanese, several Chinese), Power Attack, Ranged Attack 10, Redirect, Second Chance (pain effects), Takedown, Weapon Bind. Acrobatics 7 (+13), Athletics 9 (+12), Deception 5 (+7), Expertise: Martial Arts 7 (+10), Insight 6 (+11), Intimidation 4 (+6), Investigation 4 (+7), Perception 6 (+11), Persuasion 4 (+6), Sleight of Hand 6 (+10, Limited 2 – contorting and escaping only), Stealth 4 (+10), Technology 7 (+10, Limited 3 – security only), Treatment 3 (+6), Vehicles 2 (+6, Limited 2 – land vehicles only). Responsibility Daniel feels he must live up to his legacy as the Iron Fist. Public Identity The Iron Fist’s identity is well known. Self-Doubt When Daniel’s worthiness of the Iron Fist is called into question, he may suffer from extreme self-doubt. When this occurs, he suffers a -5 penalty on Will and Insight checks versus character interaction based on tearing down his identity. His Fearless advantage does not protect against this kind of assault. Unluck This is not a specific Complication, but the GM should be generous in assigning Complications to the Iron Fist, reflecting the misfortune that seems to follow him everywhere. Most of the Hero Points he gains in this fashion are used to fuel extra effort and power stunts. Trade-off areas Attack/Effect PL 12, Dodge/Toughness PL 10, Parry/Toughness PL 10, Fort/Will PL 10. Point total 189. Abilities 72, Defences 23, Skills 36, Powers 19, Devices 0, Advantages 39. Equiv. PL 13. Iron Fist — Strength-based Damage 11. Close Attack 6, Defensive Roll 3, Evasion, Extraordinary Effort, Improved Initiative, Improved Disarm, Improved Grab, Improved Hold, Improved Trip, Instant Up, Languages 4 (Kunlunese, Japanese, several Chinese), Ranged Attack 8, Redirect, Second Chance (pain effects), Takedown, Weapon Bind. Acrobatics 7 (+12), Athletics 7 (+10), Deception 6 (+8), Expertise: Martial Arts 7 (+10), Insight 6 (+10), Intimidation 4 (+6), Investigation 4 (+7), Perception 6 (+10), Persuasion 5 (+7), Sleight of Hand 6 (+10, Limited 2 – contorting and escaping only), Stealth 4 (+10), Technology 7 (+10, Limited 3 – security only), Treatment 3 (+6), Vehicles 2 (+6, Limited 2 – land vehicles only). Self-Doubt When Daniel’s worthiness of the Iron Fist is called into question, he may suffer from extreme self-doubt. When this occurs, he suffers a -5 penalty on Will and Insight checks versus character interaction based on tearing down his identity. Trade-off areas Attack/Effect PL 15, Dodge/Toughness PL 9, Parry/Toughness PL 10, Fort/Will PL 10. Point total 176. Abilities 68, Defences 23, Skills 32, Powers 18, Devices 0, Advantages 35. Equiv. PL 12. By Jackson, Richard Lyon and Sébastien Andrivet. Helper(s): Hart, Nick Yankovec, Philip Mason, Paul ’Z‘ Ewande, Skylord163, Jay Myers, Gareth Lewis, Eric Langendorf, Capita_Senyera, Hoyasooner, Roy Cowan, Alan Wilkinson. DCA stats by Pawsplay.